A giant boulder with a prehistoric carving of either the mythical Chinese “Feather Man” or an “alien from outer space” was recently discovered by archaeologists near a village in Guangdong Province. 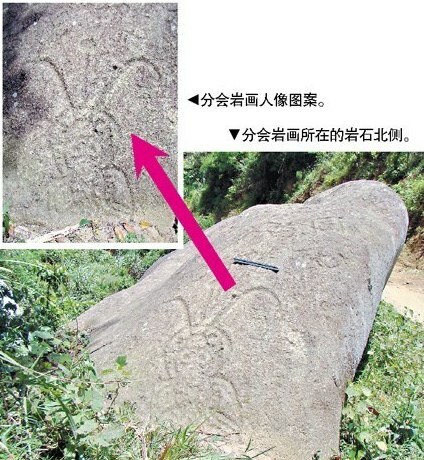 An article entitled “Guangdong’s Luoding Village Discovers Rare Rock Art” describes the rock drawing as a person wearing a helmet with a feather attached to each side and an “antenna” sticking out the top. Rock Drawing of "Feather Man" or "Alien from Outer Space"
According to the article, experts disagree as to the identity of the portrait. Some believe that it is an alien from outer space. Others believe that it is a leader of the ancient “Bai Yue” people (百越人). Still other experts believe that it is actually an astronomical observation tool or compass. The boulder is very large with a length of 14-15 meters, a width of 6 meters and a height of about 10 meters. In addition to the strange portrait, the rock has many other petroglyphs. Most appear to be star constellations with stars represented by circles with a dot in the center. There is also a picture of a horse and there are symbols which resemble written characters. According to Mr. Chen Dayuan (陈大远), the former head of the Luoding Municipal Museum (罗定市博物馆), there are three carvings of people on the rock. The one that is the clearest shows a person wearing a helmet. The eyes and nose can be easily recognized and there is a circle drawn on the forehead. A line extends upward and outward from each side of the helmet. Another line, which resembles an “antenna”, extends straight up from the top of the helmet and has a small ball at the tip. Mr. Chen states that no historical records exist concerning the rock. He believes that, based on the designs and the primitive method of carving, the boulder probably served as a prehistoric ritual site. People have tried to make rubbings of the rock art but have not been successful because the incised lines are too shallow. He says this is probably the result of the artist having had to use blunt stone tools to chisel the designs. This is further evidence that the rock art dates from the Stone Age. The article proposes three possible explanations for the “amazing” portrait. Mr. Chen believes it may be the image of the mythical “Feather Man”. “Feather Man” (yu ren 羽人) was a legendary immortal who had wings and a body covered with feathers. He was first mentioned in “The Classic of Mountains and Seas” (山海经), an ancient Chinese text dating back more than 2,200 years. The Daoists (Taoists) also believed that “Feather Man” would appear to assist a person as he neared immortality because an immortal’s arms transform into wings enabling him to fly. If the figure is not “Feather Man”, Mr. Chen says it may be an alien from outer space. A third theory is suggested by Mr. Han Dongshan (韩东山) of the Guangzhou Five Goats Planetarium (广州五羊天象馆). Mr. Han believes that the large red sandstone boulder was used by the ancient “Bai Yue” people that inhabited the area as an astronomical observation platform. Mr. Han discovered that the “antenna” on the top of the helmet points precisely south and he therefore believes that the portrait may actually be the very earliest example of a fixed south-pointing compass. While this large boulder with the mysterious rock art is recognized by archaeologists as “an important newly discovered cultural relic”, it has been known to the local villagers as the “Parents-in-law Rock” (公婆石) for a very long time. Mr. Shen Guangquan (沈广泉), an elderly villager of more than 70 years of age, can recall his great-grandfather telling him that many years ago people would go to the rock to bow in worship and to burn incense.